Brussels sprouts salad with maple balsamic dressing is a healthy winter salad that’s perfect for dinner. This simple salad with bacon, pomegranate, walnuts, and cheese is sure to please. The sweet vinaigrette complements the crunchy fresh greens, making this salad temptingly delicious. Looking for a fall salad that’s a bit different? This brussels sprouts salad with maple balsamic dressing is a crunchy, colorful, and healthy celebration of winter flavors. How do I shred brussels sprouts? Slice with a sharp knife to the desired thickness. Can you eat brussels sprouts raw? Since brussels sprouts are a member of the calciferous family (like cabbage, broccoli and cauliflower), these vegetables are easier to digest when cooked, but you can definitely eat them raw. They provide a nice crunch to a salad. Gather all the ingredients for the salad. Shred the brussels sprouts and crumble the bacon. Dry toast the walnuts in a large skillet. Watch it closely and stir constantly until they’ve darkened and have a fragrant aroma. Rinse the pomegranate and cut four slits in the skin from top to bottom. Submerge it under the water, and pull it apart. A gentle rub will loosen the arils, and they will sink to the bottom of the bowl. Remove the white pith from the bowl, then strain. Mix the shredded brussels sprouts, chopped kale, and spring lettuce mix together in a large bowl. Gather the ingredients for the maple balsamic dressing. Add the crumbled bacon, toasted walnuts, pomegranate arils, and the cheese (feta or blue) to the mixed greens. Generously drizzle the salad with maple syrup and sprinkle with salt. Toss with salad tongs to get the dressing evenly mixed. Garnish with crumbled bacon, toasted walnuts, pomegranate arils, and feta or blue cheese. Wash the brussels sprouts when you’re ready to use them. Easily release the pomegranate arils by scoring the pomegranate skin with a knife, submerging it in a bowl of water, and gently pulling it apart. Toast the walnuts in a dry pan, stirring constantly to prevent burning. Reheat the crumbled bacon just before assembling the salad. Try feta, blue cheese, or Parmesan shards in this salad. Try other add-ins like red onion, roasted garlic, and dried cranberries. Substitute the spring lettuce mix with shredded cabbage or additional kale. Even if you’re not a big brussels sprouts fan, I think you’ll love this crunchy, healthy salad. It’s colorful, healthy, and easy to make! Eat your veggies this fall and winter with these delicious salads. Roasted Sweet Potato, Wild Rice, and Apple Salad: this colorful celebration of fall flavors is healthy and yummy. Arugula Salad with Andouille Sausage: this flavorful salad is made with peppery arugula, roasted veggies, and homemade dressing. 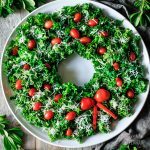 Kale Christmas Wreath Salad: a low carb salad that’s make ahead friendly. You’ll love its lemon garlic flavor! Did you make this brussels sprouts salad with maple balsamic dressing? Please leave a recipe rating below! Cook the bacon in a large skillet over medium heat, using a fork to turn the slices. Drain on paper towels and crumble into smaller pieces once cool. Toast the walnuts in a large skillet over medium high heat. Stir constantly for 5 to 6 minutes, or until the walnuts smell fragrant and slightly change color. Let them cool in a single layer on a paper towel. Score the pomegranate with a paring knife from top to bottom in four places, being careful not to cut the arils inside. Submerge the pomegranate in a large bowl of water and pull it apart with your fingers. As you gently loosen the arils from the pith, they will sink to the bottom and leave the pith on top. Skim off the pulp and drain the arils. Slice the brussels sprouts with a sharp knife. Start by cutting off the base, then thinly slice. Rinse and drain the sliced brussels sprouts in a large colander. Mix the kale, salad greens, and the brussels sprouts in a large bowl. Set aside some of the bacon, walnuts, pomegranate, and cheese for garnish, and add the rest to the greens. Mix with your hands. Whisk the vinegar, maple syrup, mustard, salt, and pepper, then slowly stir in the olive oil. You’ll have 1 cup of dressing. Store the leftovers in a mason jar in the fridge. Pour half of the salad dressing (roughly 1/2 cup) on to the salad and toss with salad tongs. Drizzle the salad with maple syrup and sprinkle with salt, then toss again. Taste and adjust the syrup and salt. Garnish with remaining bacon, walnuts, pomegranate arils, and cheese. To make ahead, store the greens in a bowl and the dressing in mason jar. Keep the crumbled bacon, toasted walnuts, pomegranate arils, and cheese separate. Assemble the salad just before serving. Pour the dressing only on what you plan on eating. The greens keep better without the dressing.